Sleek, compact, quiet, powerful, and portable. Linear tip vibration, for more efficient and more comfortable scaling. 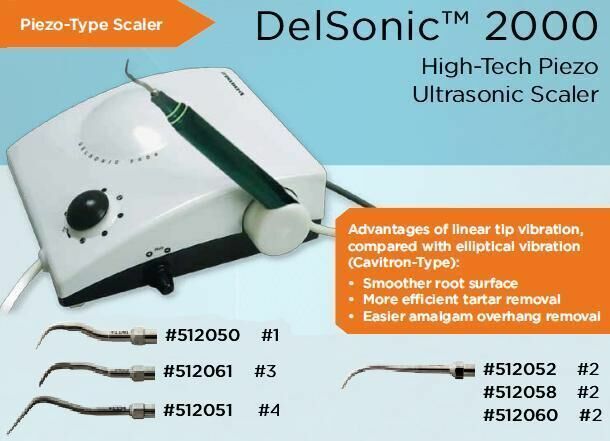 High frequency 30 kHz design provides greater patient comfort than the competition - less vibration against teeth. Cool running, high torque handpiece - minimal tip warmth. Fully autoclavable handpiece sleeves, so purchasing additional handpieces is not necessary. Range of tips available for all clinical needs. Tips are designed to introduce spray even into deep pockets.